Rudd, roach and skimmers put in an appearance in the Yaxley, Farcet, Holme and District AC match fished at Monks Lode. John Furnell led the field with 5lb 2¼oz, mainly caught on red maggot and waggler. Second was Paul Marriott who also opted for the waggler and red maggot approach, fishing the far bank for 4lb 3oz. Third was John Ayres with 4lb. Peterborough & District AA members fished the high bank at Gunwade at Ferry Meadows on Sunday which saw all the leading weights coming from the high numbers. Out in front was Mel Saggers with a weight of 14lb 5oz on peg 43. Very close behind was Graham Page with 14lb 2oz from peg 41 then came Pete Molesworth with a weight of 8lb 9oz. 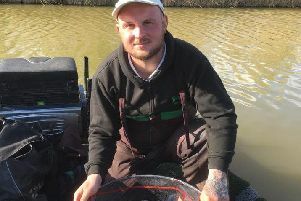 It’s been a good week for Mel Saggers as he also took the top spot in the Tuesday Club event fished on the same pegs at Ferry Meadows. This match saw him on peg 34 catching on a short pole line with red maggot. Mick Smith came in second with a net of roach and hybrids taken on corn and caster. Robin Smith was third with 10lb 14oz.